One of the greatest and most spectacular parties in the world is the Rio Carnival in Brazil organized every year in February. 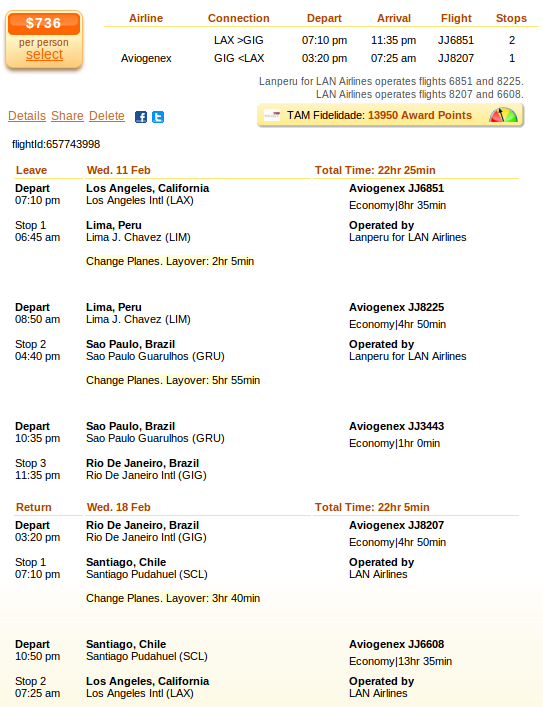 With this Los Angeles to Rio de Janeiro flight for $736 r/t including taxes you can fly to the country exactly for the Carnival. Book your ticket with Aviogenex and save nearly $300 compared to any other airlines.You can book this Rio de Janeiro flight deal on Cheapoair, but we have found it on Travelgrove, so you should start your search there. To be sure there is no better deal out there check some other merchants also for the same route and dates. The Brazil flight starts from Los Angeles International Airport (LAX) on February 11 and return on 18 from Rio de Janeiro – Galeao International Airport (GIG). The departing flight has got two stops, one in Lima and one in Sao Paulo while the return flight has only one in Santiago de Chile. The TAM Fidelidade frequent flier program will give 13,950 award points for those booking this deal. As you will see in the table, the flight of Aviogenex costs only $736 r/t while the next best flight deal is $273 more expensive, it is a US Airways airfare for $1,009 r/t. This entry was posted on Tuesday, October 21st, 2014 at 5:22 am and is filed under Airfare Deals. You can follow any responses to this entry through the RSS 2.0 feed. You can leave a response, or trackback from your own site.